Do you remember the last time you were stressed? Chances are it was a lot more recently than you think. The feeling of anxiety and tension is so common; many people think they are OK unless they are having a heart attack. But the truth is that stress has a sneaky way of building up in you until it becomes a serious problem. Stress is considered an emotional issue because it’s the way the body responds to what it perceives as an acute threat. The nervous system releases adrenaline and cortisol, which are stress hormones. But that’s not all. “Often people don’t associate physical manifestations with stress,” says Jeffrey Borenstein, M.D., president & CEO of the Brain & Behavior Research Foundation, fellow of the New York Academy of Medicine and chair of the Section of Psychiatry at the Academy. A recent study shows that negative emotions, such as stress, are linked to poor physical health in more than 150,000 people in 142 countries. If the body produces these hormones on regular basis, they hurt the immune, digestive, musculoskeletal, and nervous systems. 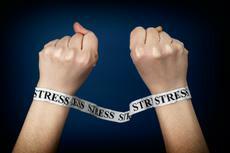 Some physical signs of stress can often be mistaken to be symptoms of some other issue. So listen closely to what your body is trying to tell you. It responds to stress and whatever is causing it in similar ways but the symptoms are different for everyone. A lot of people who are overstressed experience change in habits such as drinking more and eating more (or less) which can result in weight changes (which can add even more stress) instead of being careful, exercise regularly, speak to friends or family and “realize that they are not in this alone,” according to Borenstein. The extra pounds people gain under stress is usually abdominal fat because the adrenaline and cortisol make you hungry for carbs and fat. If your jeans aren’t fitting anymore and it’s very difficult to lose the recently gained weight even though you are exercising regularly, stress is likely the key reason why. Periods often come with cramps and women simply endure because “that’s what happens.” However, stress can make them incredibly painful, up to a point where you physically can’t do anything but stay in bed all day. Your periods may completely stop (secondary amenorrhea). Again, working out will help with that condition. Everything is fine during the day but at night, while you’re sleeping, you’re not realizing that you’re grinding your teeth. You don’t know it’s happening until you wake up and your jaw is sore. If that’s the case, try to notice if your “grinding the stress out” during the day as well. It can lead to, other than pain, tooth damage and cracked teeth. Make a dentists appointment to see if there is anything you don’t know about.